When my hairdryer died last week, I loved that I could just order a new one online from Myer (free delivery!) and didn’t have to face the crowds. If Myer went totally online, the Christmas Windows would be one of those powerpoint slideshows with really bad xmas music and lots of animated sparkly glitter. I guess the Boxing Days sales wouldn’t have the same crush of shoppers if retail all went on line. 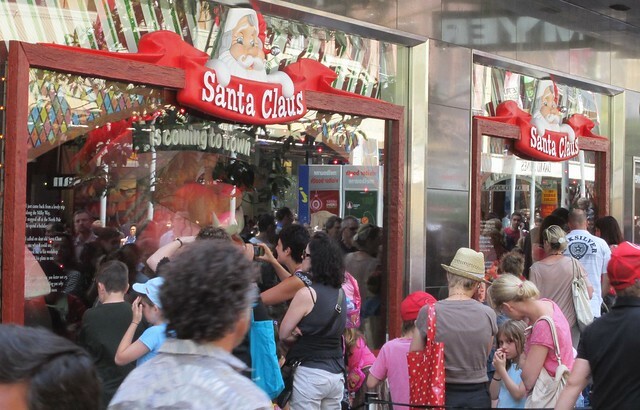 Myer’s Christmas windows are only Myer’s Christmas windows because they’re in real life, surely. If Myer went totally online, I would hope they’d find some way to keep them. Whatever happens I really don’t see online retail as the sole reason department stores are going down the toilet. After looking for a new suit in Myer and David Jones recently I couldn’t fathom why I would ever return to either store as a first port of call looking for a new suit again. Me: “I’m looking for a 3 piece light grey suit”. Salesman: “Oh we don’t have a 3 piece, we’ve got a two piece, but if you want the three piece you’ll have to look at some of the other brands ranges”. Then pretty much the same conversation would be had with 6 other sales people because none of them know half the range on the floor and are only responsible for one brand. In the end I went to a smaller store, where I was offered a drink (beer, whisky, gin!) the Salesman was very knowledgeable, did a proper fitting and alterations at little expense, gave me good advice about dry cleaning the suit, helped me learn how to tie a bow tie, and importantly the suit was good quality and good value. That store will almost certainly be the first place I look for any formal or business attire for a long while to come. There is a threat to department stores from online shopping, but there is in my opinion a larger threat from smaller retailers who offer much more personal and enjoyable service whilst still remaining competitive price-wise. Oh and as for the windows, they have really gone down hill over the last 5 years, tacky and cheap looking. Also does anyone remember the Myer toy department that had the giant talking monopoly board, soldiers that talked to you when you entered the room and the sad old robot that complained about how out-dated he was compared to his new-fandagled counterparts (that were for sale)? That’s the sort of thing that used to once upon make me actual enter a department store. When I’ve got kids I can’t see any reason why I’d choose Myer over any other store these days. Just mentioning the old toy department brings back memories. I was probably only 5 when I visited (19 now) it with the monopoly board and everything. That was certainly an experience and It must have been good because I remember it. I think what’s happened to retail in general (and using myer as a case study) is that as chains have opened new stores in suburban shopping centres it has diluted the talent pool of staff, and also it has made huge stores (such as myer Melbourne) less feasible as less people travel to the one store and instead shop at the local new store. Thus, this two pronged effect has diminished what was once the retail “experience.” If you notice, Myer Melbourne started shrinking from the mid nineties well before Internet shopping was a threat. However, the same is happening with all the other chain retailers as well.